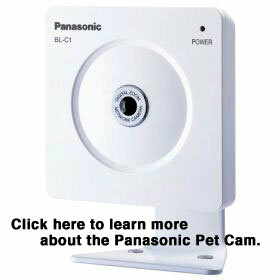 The Panasonic Pet Cam makes it easy to see what is happening there, when you can't be there in person. The best part, this network camera allows you to always feel close to your animals, whether at work, traveling or on vacation. Want to order your own? Simply click the photo above. Did the dog walker show up on time? Is your German Shepherd sleeping on the furniture? Is the cat scratching up your new leather sofa? You can find out what is happening for yourself instantly with this webcam. Without being too "techy" I will tell you that this network camera, the Panasonic Pet Cam, can be easily viewed and controlled from a standard Web browser, video display, or even a compatible cell phone or PDA if you have one and no PC is required on location. Each of these cameras comes with its own free web address, which allows you to track the camera automatically. All you need to watch is a regular web browser - all of the other required software, including control software (TCP/UDP) and e-mail software (SMTP), are already installed inside the camera.